Author: Sabine Littig. Edited by: Wilhelm J.G. Möhlig, Bernd Heine. 16 pp. Roman, 227 pp. 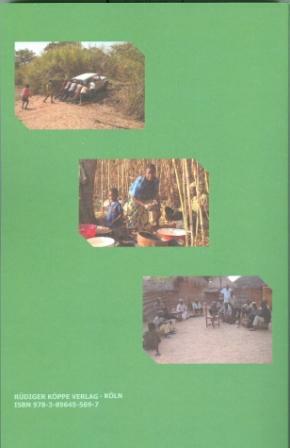 The present work is the first scientific monograph about Kolbila, a Central Adamawa language belonging to the Samba-Duru branch. 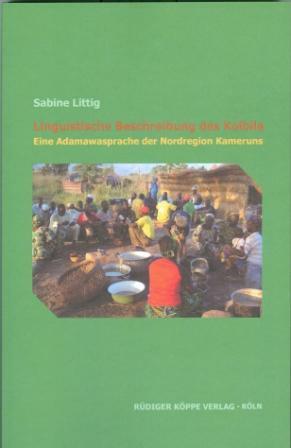 It is spoken by about 2.000 L1 speakers in several, prevailing very small, communities that reach from Cameroon’s Region du Nord up to the Region du Adamaua. The work's objective is to measure and describe the complexity and individuality of the language. Besides various typological and functional linguistic theories, the approach of the Radical Construction Grammar by Croft (2001) is taken as a basis. In this case, semantic functions are determined through the constructions where they are used. An analysis model, which turns away from classical linguistic classification of phonology, morphology and syntax and tries to combine the interfaces of several linguistic levels of analysis, is chosen. The system of phonemes including suprasegmental features like sound and nasality is captured and presented at a glance. Linguistic entities are obtained and described by state and range of functions on the empirical basis of monological texts. However, special focus is placed on the analysis of word classes according to their semantic-syntactic specificity. Parts of speech are examined for formal and functional aspects and analysed by means of characteristic constructions, where they are used. If there are significant similarities, the linguistic entities are put in relation to the neighbouring Adamawa languages and on the whole, the typical characteristics of the language family are examined. A typical feature of Kolbila concerns the variability of the sequence of constituents. This is important because it reduces to the question of the internal structure of the Adamawa languages in general as only a part of those languages shows a similar variability regarding the sequence of constituents. Due to this feature, close relationship links can be elaborated. Furthermore, the results deduce general assertions about the development of OV sequences of basis constituents in Niger Congo languages (e.g. Mande languages) in general. The language analysis under sociolinguistic aspects reveals that Kolbila is an endangered language for which language death is predicted.